As one of the first purchases made for the new Derby stud, Canterbury Pilgrim was also one of the most astute. A classic winner in her own right, she produced the sire sons Chaucer and Swynford, an accomplishment which made her one of the most influential horses, stallion or mare, of the Twentieth Century. Canterbury Pilgrim was bred in England by the Duchess of Montrose, foaled in 1893 at her breeder's Sefton Stud, Newmarket. The Duchess Caroline (born Caroline Agnes Beresford) had married James Graham, the fourth Duke of Montrose in 1836 at the age of 18. In 1874, her husband died, and she remarried two years later, to the prominent racehorse owner William Stirling-Crawfurd, who had already enjoyed classic wins with Mayonaise, Moslem, Gang Forward, and Craig Millar. After their marriage, Crawfurd's success continued, and in 1878, he won the Derby with Sefton. In 1881 his filly Thebais won the 1,000 Guineas and Oaks, and the following year, her sister St. Marguerite won the 1,000 Guineas. Crawfurd also raced the good miler Energy (1880), who became an important sire in France for Edmond Blanc. In 1882, the Duchess purchased a large tract of land that had been a dairy farm outside of Newmarket on the Snailwell Road, and named it Sefton Stud in honor of her husband's Derby winner. Crawfurd died in 1883 and the Duchess carried on, guided in her venture by farm manager John Griffiths, formerly the head groom at Blankney Stud, where he had handled Hermit and Galopin. Sefton Stud flourished for just over a decade, its products including Oaks and St. Leger winner Seabreeze, Oaks winner Canterbury Pilgrim, as well as Janissary, Roquebrune, Loved One, and St. Mirin. The Duchess of Montrose died in 1894, however her son, the Duke, had no interest in carrying on the stud, and dispersed the bloodstock the same year. The real estate, initially sold to a syndicate, was resold almost in its entirety to the sixteenth Earl of Derby, who was revitalizing the family's racing stud, primarily based at Knowsley at the time. The Newmarket property was divided into parcels now known as Stanley House Stables, Woodland Stud, and Plantation Stud. The Duchess' final crop of yearlings were sold at Newmarket in July, 1894. The St. Simon - St. Marguerite filly named Roquebrune brought 4,100 guineas from Sir James Miller. A stakes winner, she gained more fame when her first foal, Rock Sand, won the English Triple Crown in 1903. The Janissary - Seclusion filly named Lock and Key wound up as a broodmare at Knowsley and produced Lord Derby's first classic winner Keystone II, winner of the Oaks in 1906. But it was the Tristan - Pilgrimage filly named Canterbury Pilgrim which proved the best buy of all. Lord Derby, who was being advised by the Duchess' former manager, Griffiths, purchased Canterbury Pilgrim for 1,800 guineas. Pilgrimage sold that same year to J. W. Larnach for 160 guineas, carrying a foal by Janissary that would become Jeddah, winner of the Derby Stakes in 1898. Canterbury Pilgrim's sire Tristan (by Hermit - Thrift by Stockwell) was an outstanding stayer but a horse of extremely difficult temperament. He ran 53 times over five seasons, winning 29 of these. The model of versatility, soundness, and gameness, he was also half mad, seeing the world through an angry red haze, making him dangerous to be around. His career highlights included a win in the Ascot Gold Cup at five, three consecutive runnings of the Champion Stakes (twice in a dead heat), three straight runnings of the Harwicke Stakes, back-to-back runnings of the Epsom Gold Cup, and back-to-back runnings of the Grand Prix de Deauville. The early part of his six-year-old campaign was spent in the shadow of the mighty St. Simon, whom he chased home in a public trial in May, and then in the Ascot Gold Cup (beaten by 20 lengths, clearly on an off day). Tristan Tristan entered stud in France, where his met with only moderate success, although he sired the 1889 Dewhurst Stakes winner Le Nord and 1893 French 2,000 Guineas and Champion Stakes winner Le Nicham. In 1891, Tristan was purchased by the Duchess of Montrose to replace her deceased home sire Isonomy. Canterbury Pilgrim was one of the few good products to come of that move. The mare Mary Hamilton was from the same 1893 foal crop as Canterbury Pilgrim, and she later produced the Irish Oaks winner Mary Lester. From the Sefton Stud dispersal in 1894, Tristan was purchased by interests in Austria. In a mad rage in 1897, Tristan, ended his own life by bashing his head against the walls of his brick stall. Canterbury Pilgrim's dam was the classic-winning Pilgrimage. 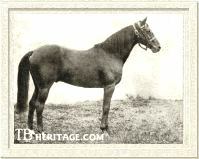 Bred by James Cookson of the Neasham Hall Stud, Durham, in 1875, Pilgrimage's dam, Lady Audley, had been bred to two stallions the previous spring due to the apparent failure of the first, so Pilgrimage goes down in history with one of the most famous dual-parentage notations in the Stud Book, recorded as being "by The Earl or The Palmer." Of the two, The Palmer was much the better, and almost certainly the true sire of Pilgrimage. A brother to Rosicrucian, he was described by his trainer as "a decidedly useful and a very honest horse," who dueled with Hermit as a three-year-old. At stud, besides Pilgrimage, he also sired 1880 Oaks winner Jenny Howlet, and after some years at stud in England, was sold to Germany where he was twice leading sire. Pilgrimage As a yearling, Pilgrimage was sold for 200 guineas to Mr. Gerard (later Lord Gerard). She ran five times at two, winning four races including the Dewhurst Stakes; her only loss being a third in the Middle Park Plate. In September of that year she was purchased for Viscount Lowther by Capt. Machell. At three, despite a nagging lameness, Pilgrimage beat colts Insulaire and Sefton in the 2,000 Guineas (Sefton next won the Derby over Insulaire), then defeated Jannette in the 1,000 Guineas. In the Oaks, Jannette turned the tables and held off Pilgrimage for the win, although Pilgrimage broke down in the stretch to finish very gamely on three legs, but ended her race career in the process. Pilgrimage was acquired by the Duchess of Montrose, for whom she produced, prior to Canterbury Pilgrim, the stakes winners Loved One (by See Saw), Lourdes (by Sefton), Shrine (by Isonomy), and Mecca (by Isonomy). Loved One went on to sire the significant broodmares Gondolette and Doris. Shrine produced 1901 Prix du Jockey Club winner Saxon. Pilgrimage also produced stakes-placed Pilgrim's Progress (by Isonomy), who became a leading sire in Australia. 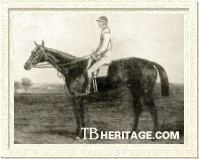 Pilgrimage, then 18-years-old, was sold at the Sefton dispersal in 1894 for 160 guineas. At the time it was uncertain if she was in foal to Janissary, but the next year at Eaton Stud, she produced Jeddah, who won the Derby in 1898. Pilgrimage's yearling filly by Tristan was purchased out of the Sefton dispersal consignment at the 1894 Newmarket July yearling sale for 1,800 guineas. At the time of sale, George Lambton, her future trainer, noted (in "Men and Horses I Have Known) that she was "rather on the small side, with a good back and loins, but with a short neck and very low withers." But she "had the best of legs and feet" and had been recommended by Lord Derby's new stud groom, the same John Griffiths who had raised all of Pilgrimage's foals at Sefton, including this one. It was Griffiths who encouraged the Earl's son, Lord Stanley, to buy the little chestnut Tristan filly on his father's account to re-establish the Derby stud as a racing and breeding dynasty. High strung and difficult to train, probably a legacy from her sire Tristan, Canterbury Pilgrim started five times at two, but she only showed form once, when running third in the Knowsley Nursery Stakes at Liverpool. Lambton was disheartened, since the backward filly had shown speed, but seemed unable to carry it past three and a half furlongs. After making the early pace in the Champagne Stakes, the Pilgrimage filly quickly faded to last, but a more experienced eye had seen the promise. Trainer Robert Peck, who had trained a similar type in Marie Stuart, advised Lambton "Don't be downhearted about your mare, she will be a stayer, and will probably win the Oaks." In the transition from two to three, Canterbury Pilgrim grew up somewhat (she was always small) and became very much "on the muscle" during her works, pulling strongly with what was already a hard mouth. Difficult to work around due to her propensity to kick and bite, she was teamed with a quiet older gelding named Flare Up, who became her only workmate and constant companion. His steady presence cooled the fires to a level of manageability. Pointed to a season debut in the Oaks, she began to thrive on her long works. Lambton noted "The harder she worked the more she ate and the bigger she got, and that is a characteristic of many of her descendants. They are often most difficult and disappointing in their early work, but, if once you get them going the right way, the more you give them the better they like it." She had one trial before the Oaks, winning with ease. The corner had been turned. Canterbury Pilgrim proved victorious in the Oaks by stalking the pace and rushing past 1,000 Guineas winner Thais in the straight. She was then backed up from the twelve furlongs of the classic to the one mile Coronation Stakes at Royal Ascot. Using different tactics than in the Oaks, which Lambton admitted was his error in judgement, she was sent to the front but died "like a snuffed candle" a quarter of a mile from home to finish fourth. She returned to the winner's circle in her next start, however, following a facile victory in the Liverpool Summer Cup. At this juncture, health problems forced Lambton to the sidelines and training was taken over by head lad Harry Sharpe, and Charles Morbey. Canterbury Pilgrim next started in the Park Hill Stakes, the filly equivalent of the St. Leger at a mile and three-quarters, and won "in a canter." She was then unplaced in the Cambridgeshire Handicap, but bounced back two days later to win the two-and-a-quarter mile Jockey Club Cup, beating Gulistan to the winner's post by 15 lengths. Due to her often self-defeating, volatile nature and the foreboding presence of the mighty Persimmon as the leader of that season's colts and who would be her main competition the following year, Canterbury Pilgrim was retired to the broodmare paddocks at Knowsley with a record of four wins in ten starts, and a proven stayer of great class. Canterbury Pilgrim had ten foals for Lord Derby, seven of which were fillies. With this kind of production, it would be expected that her daughters would have left an enduring legacy, but as it turns out, Canterbury Pilgrim's most important and influential progeny were her sons Chaucer, a great sire of broodmares, and Swynford, a great sire of sires. 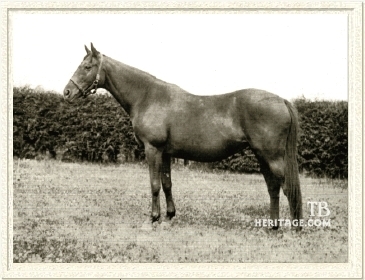 Canterbury Pilgrim's first foal was ST. VICTORINE, a brown filly by St. Serf foaled in 1898. St. Victorine never raced, and was a disappointing producer, with only three winners. Her most important offspring was the unraced filly Entebbe (by Bridge of Canny), who had two useful daughters, White Ant and Widow Bird who stayed in the Derby Stud. White Ant's daughters did little to embellish the family. Widow Bird, on the other hand, became the ancestress of the French horse Djebelilla, and the good two-year-old Star King, winner of the Gimcrack Stakes and Richmond Stakes. When sent to Australia, Stark King was renamed Star Kingdom, and became and epoch-making sire there. Chaucer Missing in 1899, Canterbury Pilgrim's second foal was the aptly-named CHAUCER, a small brown St. Simon colt born in 1900. Although he showed good form at two, he matured into a useful handicapper at best, but was not of the classic staying caliber of either of his parents. Racing through the age of six, he won eight races from 35 starts. Chaucer was much more important as a sire for Lord Derby. 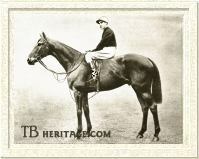 Although never topping the sires list, he was second in 1916 (after Polymelus) and fourth in 1918. He sired the classic winners Pillion (1,000 Guineas), Canyon (1,000 Guineas), Queen's Square, and Scapa Flow, and the champion filly Selene. His best colts were Stedfast (Prince of Wales, St. James's Palace, Sussex Stakes, etc. ), Prince Chimay (Jockey Club Stakes), Danzellon (Craven Stakes), and Dan Russell (Chester Vase). Chaucer's daughters became gems in the Derby broodmare band, and he was the leading broodmare sire twice, 1927 and 1933. Canyon produced 2,000 Guineas winner Colorado, as well as stakes winners Caerleon and Halcyon, all by Phalaris. Selene did her better, producing Hyperion (Derby, St. Leger), Sickle, Pharamond II, Guiscard, Night Shift, and Hunter's Moon. A lesser-raced daughter of Chaucer, Scapa Flow produced the famous brothers Fairway (St. Leger, Leading Sire) and Pharos (Leading Sire), their sister Fair Isle (1,000 Guineas), and other stakes winners Fara, Highlander, and Spithead. Chaucer daughters also produced Colombo (2,000 Guineas), Apron, Warden of the Marches, Son O'Mine, Meadow Rhu, Pervencheres, and Ponteba. Chaucer died in 1926. In 1902, Canterbury Pilgrim produced the brown filly GOURD (by Persimmon), winner of the Derby Gold Cup. She produced no major runners or broodmares for the Derby Stud. In 1903, Canterbury Pilgrim foaled another filly, GLASCONBURY (by Isinglass), a chestnut filly who came along in the same crop as Lord Derby's outstanding filly Keystone II, winner of the Oaks. Trainer Lambton rated her 21 pounds behind Keystone as three-year-olds. Blessed with her mother's soundness, in the absence of her stable companion, Glasconbury won the 1906 Nassau Stakes at Goodwood on a very hard, dry course. Later that same year, Glasconbury also performed the unusual feat of winning two races in the same day. During the First October Meeting at Newmarket, she won the first race of the day, the ten furlong Royal Stakes, by five lengths, then was rested at a nearby farm until called to appear for the sixth race, the Newmarket Oaks, at a mile and three quarters. As Lambton relates in "Men and Horses I Have Known," "The rule that horses must pass the Stands on the way to the Post had only just been brought in. We none of us remembered it and Maher [Glasconbury's jockey] got on the mare at the stables, and took her straight to the Post, with the result that she had to come all the way back again to go down so as to go past the Stands. This meant that before starting for her second race she had gone nearly five miles without including the race she had already won." Despite the confusion, and the potential disaster, Glasconbury won the Newmarket Oaks and came out of the race "fresh as paint." Unfortunately, Glasconbury had to be destroyed after breaking down in a gallop on the Limekilns at Newmarket one morning. As Lambton put it, "She was an incalculable loss to Lord Derby's stud." Canterbury Pilgrim's fifth foal was a full sister to Chaucer named WIFE OF BATH, a 1904 brown filly by St. Simon. She was useless as a runner, unplaced in all her seven starts (at two and three). Her only foal of value was the daughter Whitewash, by White Eagle, dam of stakes winners Moabite, Blanchisseuse (fourth dam of Silly Season), and White Clover. In 1905, Canterbury Pilgrim produced PILGRIM'S WAY, a chestnut filly by St. Frusquin. At two, she was third in the Spring Two-Year-Old Stakes at Newmarket, and at three was also placed in minor stakes. She left several useful daughters including the stakes winner Wayfarer (ancestress of Derby Italiano winner Don Orazio (by the above-mentioned Silly Season), Va Sano (granddam of stakes winners El Arabi and Madeh, the latter dam of Dark Caprice), and Va Via. Missing in 1906, Canterbury Pilgrim's second great stallion son came in 1907, when she foaled a bay colt by John O'Gaunt which was named SWYNFORD. Big and ruggedly handsome, not at all like Chaucer or his dam, he did follow in his dam's footsteps as a late maturing type. He raced for the new (seventeenth) Earl of Derby, the former Lord Stanley, whose father had died in June of 1908. Swynford made only one start at two but bolted out of control and was unplaced. A bothersome thoroughpin kept him off the track until the Derby the following year, in which he was unplaced behind Lemberg. Third in the St. James's Palace Stakes, he broke his maiden in the Hardwicke Stakes, and bloomed thereafter. He proved a tremendous stayer who was literally unbeatable if allowed to set the pace. He won the Liverpool Cup and St. Leger in this way, and walked over for the Liverpool St. Leger. At four, Swynford won the Eclipse Stakes, Princess of Wales' Stakes, and Chippenham Plate. His only loss that season was in the Coronation Cup, when he stalked the pace and lost to Lemberg. He broke a fetlock in a gallop that September, and was retired to stud at Woodlands for the 1913 season. Swynford was an even better sire than Chaucer, although like his brother, his fillies tended to be better than his colts. He sired six classic winners, all but one a filly, including four winners of the 1,000 Guineas (Ferry, Bettina, Tranquil, Saucy Sue), one winner of the Oaks (Saucy Sue), one winner of the Derby (Sansovino), and two winners of the St. Leger (Keysoe, Tranquil). He was the Leading Sire in Tranquil's year, 1923. 1924 Derby winner Sansovino was not his sire's best racing son, however. Blandford, winner of the Princess of Wales' Stakes, showed much more ability before he broke down, as did Challenger II, undefeated in his two starts at two before an accident compromised his racing career. St. Germans and Silurian were good cup horses. Blandford became the Leading Sire in England three times, getting the likes of Blenheim II, Bahram, Brantome, Windsor Lad and Trigo among his eight classic winners. His sireline survives through Crepello. Swynford also sired U.S. leading sires Challenger II and St. Germans, Argentine sire Silurian, Lancegaye (sire of Challedon), Swift and Sure, Birthright, Hainault, Stratford, Schiavoni, and Under Fire. Few of Swynford's good racing daughters became top producers. Among his best broodmare daughters were Drift (dam of Heliopolis, Sun Stream, Tide-Way, Fairhaven), Sweet Lavender (dam of Lavendula, Kalmia, Fragrance), Rose Red (dam of Aurora), Roseola (dam of Tornado), Sarita (dam of Sister Sarah, Sabzy), Harpy (dam of Orpen and Irish Derby winner Raeburn), and Virgin's Folly (third dam of Star Kingdom). Swynford died in 1928. 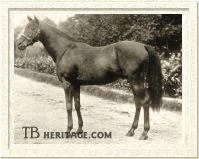 In 1908, Canterbury Pilgrim produced THE TABARD, a chestnut filly by Zinfandel who was also a stakes winner. She left no legacy as a broodmare. Canterbury Pilgrim was sent back to John O'Gaunt and produced Swynford's full brother, the bay colt HARRY OF HEREFORD in 1910. Harry of Hereford was the classic under-achieving little brother. He could never achieve the heights Swynford reached, and unfortunately, could not even win, but placed. Due to his greater sibling, he entered stud in England but after six years proved useless, and was sold to France. It's there that he sired his only offspring of value, Tesio's Italian Oaks winner Neroccia (also a good broodmare), and Annette K., who was imported in utero to the U.S. in her dam Bathing Girl. Annette K. was unraced. She produced Lawrence Realization Stakes winner War Glory (a successful sire), and the mare Brushup, better known as the dam of Triple Crown winner War Admiral. In 1914 at the age of 21, Canterbury Pilgrim produced her last foal, the brown filly NUN'S VEILING, by the obscure sire Roquelaure (a half-brother to Rock Sand). She won two races at three and produced the good filly Disguise, a stakes winner in France, and second in the French 1,000 Guineas. Disguise produced the high class colt Arcot, and English stakes winner Smoke Screen. Canterbury Pilgrim died three years later in 1917 at the age of 24. Her legacy to the breed is incalculable, since not only did she produce Chaucer and Swynford, through them and her other offspring, she appears in the pedigree of every descendant of Hyperion, Sickle, Pharamond II, Pharos, Fairway, Blandford, Sansovino, St. Germans, Nearctic, Heliopolis, Challenger II, Vatout, Star Kingdom, and War Admiral. CANTERBURY PILGRIM, chestnut filly, 1893 - Family # 1 - g.